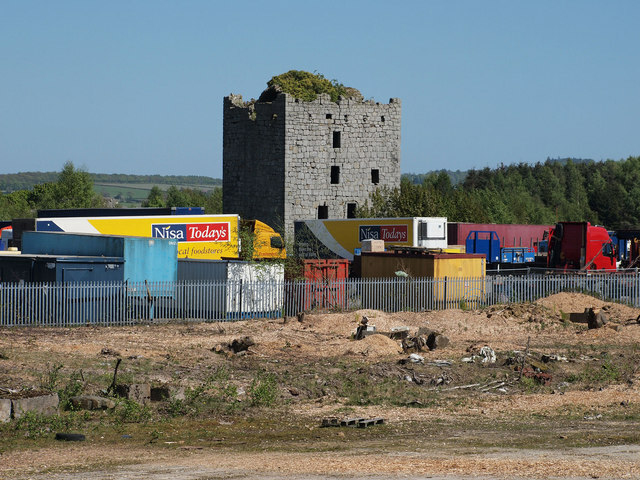 Notes: Almond Castle is a ruined L-plan castle, dating from the 15th century, three miles west of Linlithgow, and north of the Union Canal, in Falkirk District, Scotland. Alternative names are The Haining and Haining Castle. The structure is unsound.The estate originally belonged to the Clan Crawford, and they built the castle in about 1470. In about 1540 it passed by marriage to the Livingstones, who built an extension at the south west. They also built an extension along the south east wall in 1586. When James Livingstone was created Baron Livingstone of Almond in 1633 the castle's name was changed to Almond from Haining. After the Jacobite rising of 1715 the castle was forfeited to the crown by the Livinsgstone Earls of Callendar. It was abandoned in the 1750s. In 1783 the ruin was sold to William Forbes by the York Buildings Company.